As part of a study into how mainstream games can be used to increase or capture student engagement, and still be used in an educational way, I was assigned to play a modern mainstream game and write a review of that game from the point of view of the gamer. While this doesn’t on the surface seem like a terribly good way to think about using games in the classroom, it paves the way for separating myself as a gamer from myself as a teacher. In my next assignment and my next post, I will be looking at a game from the perspective of teacher, and already having my on perspective as a gamer will allow me to contrast the two perspectives and hopefully help me guide the use of games in the classroom. So without further ado, here is my review of Settlers 7: Paths to a Kingdom. Welcome to the world of the Settlers: Paths to a Kingdom, Ubisoft’s latest incarnation of its popular Settler’s series. If you are interested in all night skirmish battles or massive empire building this is probably not the game for you, but if you enjoy some basic economy building and engaging competition for resources and land, then Paths to a Kingdom is nearly ideal. Paths to a Kingdom brings to the table a rich graphic environment with engaging, though somewhat cartoonish characters and scenery. Despite the seemingly deliberate silliness of some of the characters, the attention to detail creates a very immersive environment that draws the player in. The detail remains strong even when zoomed in close enough to listen to your citizens individually or zoomed out enough to take a glance at the entire world that you are trying to rule. The game is surprisingly simple to play, but can also quickly get out of control if you are not paying attention. The game is mostly about building a well-balanced economy in one of three branches. Players can choose to focus on military, trade, or research to build their empire. 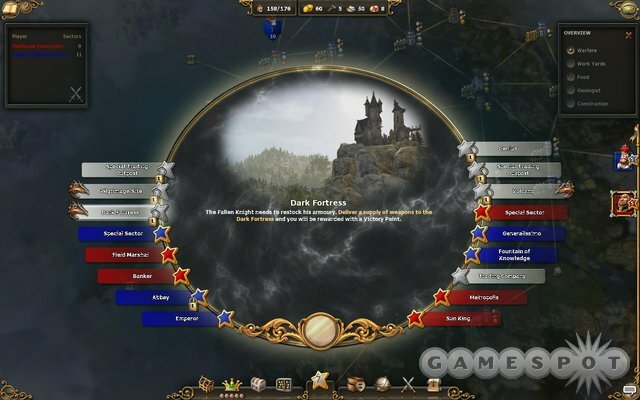 A decision as to which branch the player will take is crucial early on in the game, so that decisions can be made about which resources to pursue, which territories to conquer and which buildings to build and upgrade. Not making this decision quickly, or trying to change your decision late in the game, can ultimately prove disastrous. Your first instinct might be to immediately believe that military strength is the most logical direction to take, given the difficulty in constructing a game that can be won in any other way. With Paths to a Kingdom, however, the use of “victory points”, help keep the play more balanced. That’s not to say a military is not necessary, since your opponents, human or computer, will certainly have their eye on your territory. Still, if you can build a military strong enough to fend off the land grabbing hordes, the game offers some very interesting non-combat storylines, and if you can keep your opponent from racking up victory points, it is possible to explore more than one economic branch in a single game, leading to additional replayability. There are some challenges with the new game, beyond game-play. Ubisoft requires that you be connected to their servers at all times in order to play the game. At first this seemed to overload the servers making it difficult to actually use your newly purchased game, though as time has passed this seems less of an issue. There are a few benefits to this constant connection, including saving all games, which can then be played from any computer in the world. Ubisoft has also added some interesting social media aspect to play, including linking your game to Facebook accounts to brag about victories. Players can also register with Ubisoft’s Uplay, which allows them to upgrade and personalize their in-game castle, buy additional game content, and download game related goodies. Once you have completed the campaign mode, which is really just an extended tutorial for the game, another limitation you will find is in the number of maps. While you can certainly customize these maps to extend game play, and new maps have been added (or can be purchased form Uplay), it’s clear that Ubisoft meant to focus game play for online play rather than individual skirmishes against the computer. Despite the beautiful graphics, engaging play, and social additions, there are also some challenges with the game play itself. Once you have conquered a few territories and have created a medium to large sized economy, it becomes increasingly difficult to remember where you have put everything. There are no shortcuts for finding your buildings, or trying to find breakdowns in supply lines. Also, you can’t use the minimap to direct your armies to territories, meaning you have to select the army, and then scroll across whatever territories are in between to select the territory you need them to be in. This can be time consuming and dangerous if an enemy is on the way. 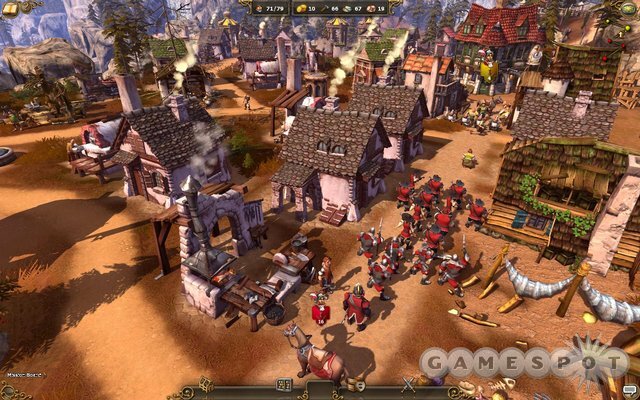 All in all Settlers 7: Paths to a Kingdom is a solid addition to the Settlers series of games. Players will find its rich graphics engaging, its gameplay balanced and fun, and its additional non-game attachments useful and fun. Education today is unequivocally being divided into two groups: those who integrate and utilize new and emerging technologies, and those who do not. Unfortunately, the world of technology is moving so rapidly, it is becoming increasingly difficult for teachers, much less students to keep up with the changes. Among the newest technologies evolving for use in education are 3D virtual worlds. These new immersive environments provide new avenues for instruction, but also bring new challenges. In many ways, technology can help teachers and administrators bridge the divide in preparing economically disadvantaged students for careers in the 21st century. Unfortunately, the high speed of change in technology can actually increase the divide between the haves and have nots. As more education moves to an online environment, students will be required to maintain an internet access point. The NAEP discovered that students who have access to free and reduced lunches are also significantly less likely to have access to a computer at school or outside of the regular school day (as cited in Education Week, 2004). Interacting in a virtual world requires a level of computer proficiency that would not be easily attainable without regular access to computers, especially outside of the school environment. It will become increasingly important for educators and institutions to find ways to reduce the growing divide in access to the tools necessary for creating 21st century learners. On the other hand, 3D virtual environments create an opportunity to provide education on a global scale. As O’Driscoll (2007) discusses, the online #D learning environment creates a “Death of Disctance” that can allow students to find exceptional teachers and classrooms that might not be available to them locally. Simulated 3D environments also provide an opportunity to engage students in a constructivist learning environment through scientific visualization as discussed by Yair, Mintz, and Litvak (2001) helping to create a constructivist learning environment in subjects that are normally restricted to textbooks and non-interactive sources. These environments give the educator the opportunity to truly become a facilitator of learning as they create the actual world in which the students will be interacting. Interactive 3D environments are a new and powerful tool for educators to use with a new generation of digital natives. They can help students interact with worlds that have previously been unreachable. However, these environments also help us understand how wide the gap has grown between those with access and those without, and the need to find creative ways to close the gap. O’Driscoll, D. T. (2007, March 22). Learing in Three Dimensions.